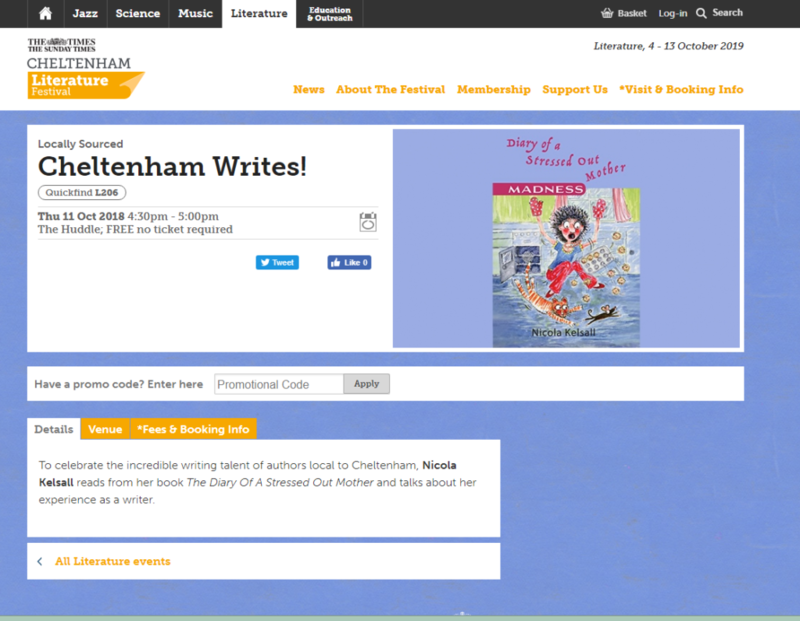 We are delighted to welcome her to the blog today to share with us her experience of speaking at the Cheltenham Literature Festival, the UK’s biggest, highest profile and longest-established litfest, in the company of bestselling trade-published authors and A-list celebrities – a great story for ALLi’s “Open Up to Indies” campaign. ‘Are you a Gloucestershire-based author looking to showcase your work at one of the largest and most prestigious literature festivals? Firstly, I write comedy, and I instantly thought they would be looking for serious, more weighty works of profundity. Secondly, even if they liked my books, I am a self-published author and Literature Festivals are not known for welcoming us in. My monthly meetings with ALLi members at our local authors’ group in Cheltenham’s wonderful Anthology Bookshop has been an inspiration to me since I joined ALLi over a year ago, and I have found the friends I have met there to be incredibly supportive and welcoming. We have a wonderful selection of very experienced people with a plethora of good advice and understanding for authors new and old. I have only been writing for four years, so I’m still a novice – particularly when it comes to the business side of self-publishing. I must say that I would not have had the courage to submit anything to anyone without the support of ALLi and ALLi members. It’s hard to keep going on your own, and I can’t thank them enough for the great advice, much-needed reassurance, and chance to connect with other like-minded souls. They were all delighted for me too, which was lovely. Throughout the summer, as the date of my appearance got closer and closer, and I saw it in black and white, printed in the brochure (another pivotal life- affirming moment! ), I began to get extremely nervous about the whole idea of speaking to a crowd of people for what suddenly seemed like an eon (half an hour actually). The thought of having to stand up and talk about myself was, frankly, terrifying. (My friends will be rolling their eyes in disbelief when they read this, because I can normally talk for England.) After agonizing for far too long, a week before, I decided to request an interview instead. I produced a set of questions, practised my answers, and with great relief, actually began to look forward to it again. Afterwards. 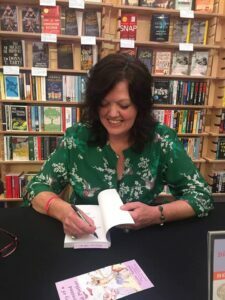 I was sent through to the book shop, where I was thrilled to discover my table was between celebrity gardener Monty Don and bestselling novelist Patrick Gale, both of whom were furiously signing books and chatting to their many fans. Since my queue was rather shorter than theirs, I had plenty of time to think about my plan to chat casually to Patrick Gale over a glass of wine in the Writers’ Room later, and my other decision to buy Monty Don’s book for my mother, and ask him to sign it with a personal message. Anyway, both ideas were completely scuppered when I realised that Patrick’s mountain of books looked as if they’d take a month for him to sign, and Monty Don had disappeared in a puff of smoke! Oh, and next time to remember to bring a decent pen for signing books – the My Little Pony biro found in the deepest recesses of my handbag was not cool! 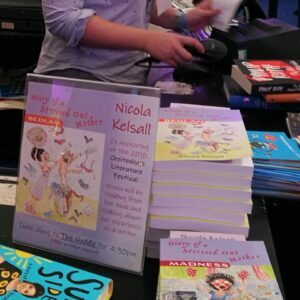 Nicola Kelsall is a writer and artist living in the Cotswolds in England and the author of a series of satirical comedy novels in the Diary of a Stressed-Out Mother series. She is currently writing the third book, "Chaos". 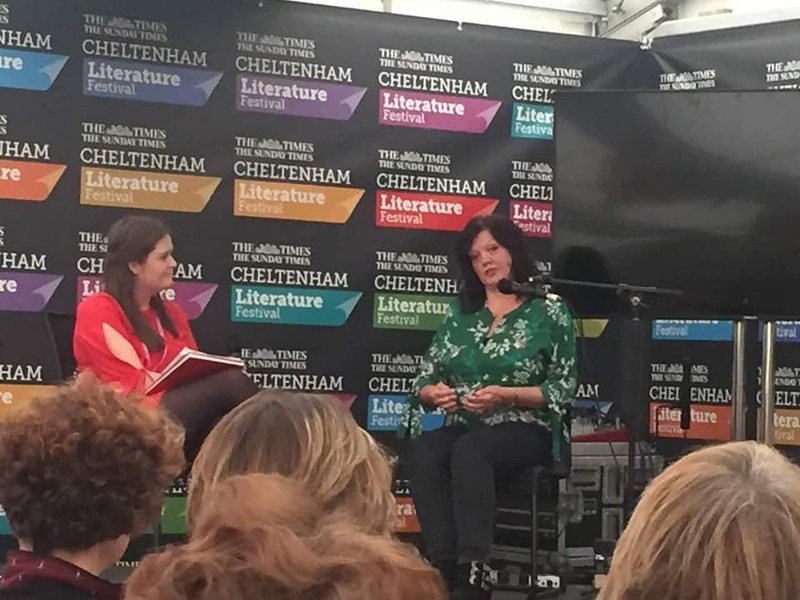 She recently appeared at The Cheltenham Literature Festival. 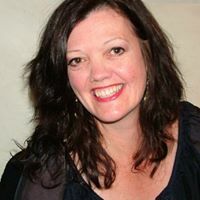 For more about Nicola's writing, please visit her Facebook page, www.facebook.com/stressedoutmother. Wonderful account. And I think your choice of biro couldn’t have been more appropriate. I too was in ‘Locally Sourced’, but in 2017, talking about my then latest novel A Change of Mind. One aspect at least changed between 2017 and 2018: although the Waterstones tent had a good supply of my books, there was no invitation to do a signing. Hopefully it is a sign that things are looking up fir indie authors! Tough luck with Patrick Gale and Monty Don though! It reminded me of the first signing I was ever asked to do, a long time before I started wtiting fiction. I was invited to Headingley cricket ground to sign a new book on cricket that I had just written, to sign copies in the tea interval of the 2000 Headingley test match between England and Australia, and they even announced it on the PA system during the afternoon. But then they also announced that also signing his latest book would be Geoffrey Boycott, a Yorkshire favourite. The tea interval came, Geoff and I took our places: his queue was about half a mile long… Mine? Absolutely zilch! What a great experience it sounds like, and how lovely of you to share it as you did. Kudos!